Of his many stylistic traits, one that often stands out to people is the way his music is orchestrated. Danny has worked with many different orchestrators over the years but his music has maintained a consistent sound and style, which suggests that many of the orchestration directions are his own even if he isn’t filling in all of the black dots. In this article I’ll discuss a few characteristic features of Elfman’s orchestration, and hopefully uncover some tips and insight that you’ll be able to apply to your own work. If you’re new to orchestration check out our article on orchestration books to get you started. 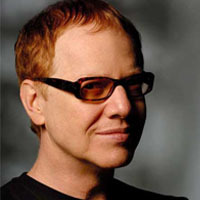 First and foremost the “Danny Elfman” sound is defined by his particular choice and combination of instruments. Although usually setting a foundation of a traditional strings/brass/woodwind orchestral palette, he also often adds saxes, piano (particularly in the left hand), bells and chimes, frequent use of harp, and of course women’s choir. The instrument choices are not arbitrary but serve the score. Bells and chimes, for example, add a touch of magic. Women’s choir, especially when on a single syllable such as “ooh”, can create a very spooky and mysterious feeling. It’s important to notice that none of these “characteristic instruments” are particularly exotic or unusual. What is unusual, however, is their frequent and constant use. It’s not the fact that Elfman uses women’s choir and celeste that defines his style, it’s the fact that he uses them almost without fail. So how does he use these different colors in the context of the orchestra? Not only does Elfman use a specific palette of instruments, he also makes sure that you can hear them. Every instrument in the music feels very tangible and the color succinct. This is because different instruments are often kept separate from each other. When you blend two different instruments together you may create an interesting new sound, but you also lose something from each individual. Combining timbres is a lot like combining colors. Mixing blue and yellow can give you green, but once you start to throw in purples and reds you eventually end up with an ugly brown mess. The same is true for combining instruments; the more colors you blend the more you can create a murky mass of sound. Elfman’s music uses this “law of combinations” in two different ways. When specific lines need to be heard, such as prominent lines like melodies or counter lines, they are usually given to single instruments or a single color of instruments (a solo trumpet or group of trumpets). When the lines are less important, such as accompaniment figures, he may soften the sound by combining instruments together. Remember that combining instruments causes lines to lose their precision and clarity. This is not a strict rule, and sometimes different timbres will play prominent lines together. But when they do, the timbres are often vastly different (strings and glockenspiel) and most often they are separated by octaves. That way even if violins and trombones are playing at the same time, they are each heard clearly and distinctly. A good example of separation is in the Main Title from Beetlejuice. At :51 when the theme comes in we hear it on french horn, and no other timbres. The other colors providing the accompaniment are tuba, trombones, piano left hand, and percussion. Although the horns and trombones are very similar in color to one another, the trombones are being used for staccato upbeats and are very clearly distinct from the theme. The most interesting thing about this example is that the combination of instruments making up the accompaniment is actually louder than the melody, but the melody still clearly comes through. The piano and tuba, though distinct colors on their own, combine into a more neutral color when they are both playing the bass line. This combination causes their individual timbres to be less conspicuous and helps make the purity of the french horn sound come through clearer. An interesting example of separation of similar colors comes from the opening to The Nightmare Before Christmas. At :17 the theme is played by trombones and french horns. Meanwhile trumpets and tuba take turns playing an immediate echo to the main two note motif. It’s only at :25 that the trumpets join the other brass in octaves to round out the end of the phrase. Despite being from the same family of instruments, the individual members of the brass section all have a unique sound. Keeping those instruments separated on individual ideas allows you to take advantage of the full range of color choices. It’s again worth noticing that while the melody and countermelody are separated colors, the accompaniment is a complex texture of combined instruments. Violins, violas, celesta (or maybe it’s harp?) and jingle bells are all working together to create a supportive bed for the main focus. Instruments do not always have to play different lines to be distinct. At 1:19 into the main titles from the original Batman the violins and trombones both play the melody line. They are separated by several octaves, which provides the advantage of a full bodied sound while simultaneously allowing you to easily hear each section of instruments clearly. The very opening of Alice in Wonderland is another example of combined colors creating a murky mass of sound for a clear timbre to be easily heard above. The accompaniment is made up of violins, violas and clarinet while the featured timbre is women’s choir. Even as more instruments are added in once the choir starts singing lyrics, their melody is never intruded on by another instrument. There are supporting chord tones and rhythmic hits but the melody is left alone. The last example comes from the Ice Dance from Edward Scissorhands with the simple lesson that you can create a very full and complex sound with a small selection of instruments. The first thirty seconds of the piece use only five distinct colors: celesta, harp, choir and high and low strings. Although there are only five timbres at play (notice I’m considering high and low strings to be different timbres), they are all given an individual line that only they play. Every arpeggio and melody line is played by only one color, but the overall sound is very full and complex. Occasionally the lines might intertwine (more on this in a future article), but they never play in unison or octaves. One of the most common mistakes made by novice orchestrators is to think that a full sound is achieved by doubling everything. Every melody and harmony is doubled, tripled or even quadrupled in unison and octaves. But the examples above demonstrate that this method of doubling is not necessarily the key to good orchestration. What seems to be more important is allowing every line in your music to come through with clarity. And by giving each timbre it’s own separate space to be heard, you can take better advantage of all of the color opportunities available to you. Although when you first think about the orchestration in Danny Elfman’s music you probably think of the instruments (choirs, celestas, etc. ), the more important and much more useful lesson is how those instruments are treated. There are many lessons to be learned by studying Danny Elfman’s music, leave your comments about what you’d like to read and learn about and expect more in the future. Fantastic article guys. I’ve actually been asked to compose an ‘Elfman score’ for the game I’m currently working on. This has been a very interesting and helpful analysis. Cheers! waiting for your new updaits ! Very interesting article! I was wondering if you had any thoughts on how this would affect marching band scoring? Maybe even in just the brass section? 1-derful analysis, thank you very much !!! Hi Love this artical On Elfman’s Music I love a lot of his music and Im Writting a Small Dissertation for my BTEC at College do you have any other articals on him that I could use as secondary sources that could help me with my work ?